Who is Nutmeg and how does its pension work? Nutmeg is one of the oldest robo-advisers in the UK, building regulated risk-based portfolios since 2011. In a world of DIY platforms pushing active funds, it offers access to low-cost managed portfolios of exchange-traded funds that users can monitor and alter online at any time of the day. Nutmeg initially started by offering ISAs and general investment accounts but entered the self-invested personal pension (SIPP) world in 2015. Technically, despite its own descriptions and press coverage, the Nutmeg pension isn’t a SIPP as you can’t choose your own assets and it only invests in ETFs for you. But you still get all the benefits of a pension, with tax relief on contributions. Traditionally, if you wanted to set up a pension you would need to make time to meet with a financial adviser to discuss your goals and they would usually choose which provider to use, or you could just rely on whatever your employer offered. Nutmeg gives you more control with an easier to use and low-cost process. When you set up a Nutmeg pension, first you need to enter your gender and age and when you plan to retire. This may be hard to know as everyone dreams of retiring as soon as possible, but you need to have saved enough to be able to maintain your lifestyle. 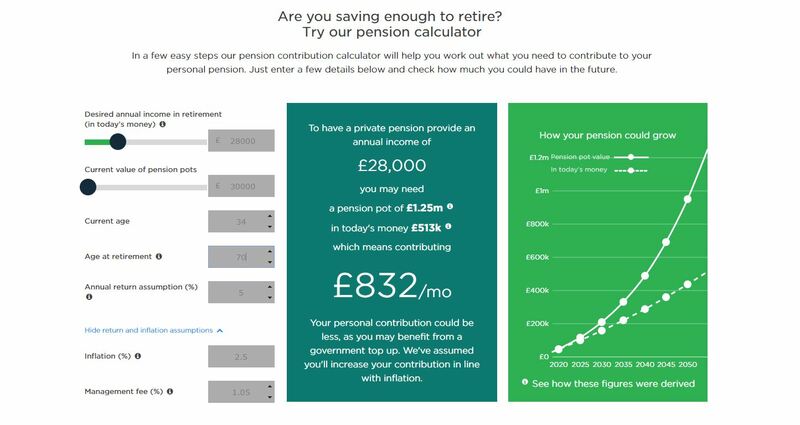 Nutmeg has a handy pension calculator (shown below) that lets you input your desired retirement income and any current pension savings to see how much you need to save and how feasible it is to reach your target by your desired age. With all this in mind you can then decide when you are aiming to retire and can even name your pension pot. You then select how long you plan to save for, how much you would like to pay in, either from transfers or monthly contributions, plus anything your employer will put in. 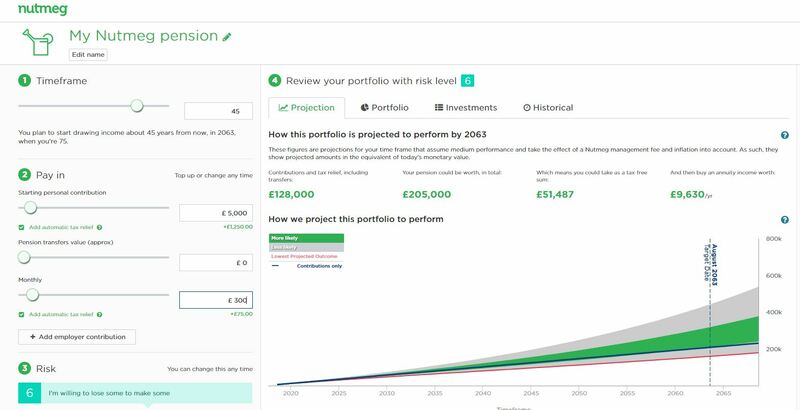 You can play around with the calculator to see how likely you are to reach your target based on the different portfolios and contribution levels. This will let you see how much to invest and how much risk to take. You will also be shown how much the portfolio will cost as well as what assets and individual investments are in each one and how a comparable portfolio has performed over the past 22 years. The projections will also tell you how much your pension could be worth in total when you come to retire, how much you could take as a lump sum, what an annuity could be worth and how much you will have contributed (see below). Once all this is decided and you register, Nutmeg will then take you through a risk assessment that helps build your profile. This has been developed by Oxford Risk and is based on 11 questions assessing your investing experience, understanding of risk and loss and your view of the stock market. Nutmeg will then recommend one of its ten portfolios based on your responses and deemed overall risk tolerance. You can retake the assessment if you are unsure of the conclusion. If you are happy, you can start setting up transfers from your bank to your new Nutmeg pension account. Users can login online and alter contributions and risk level at any point, while also monitoring performance and projections. 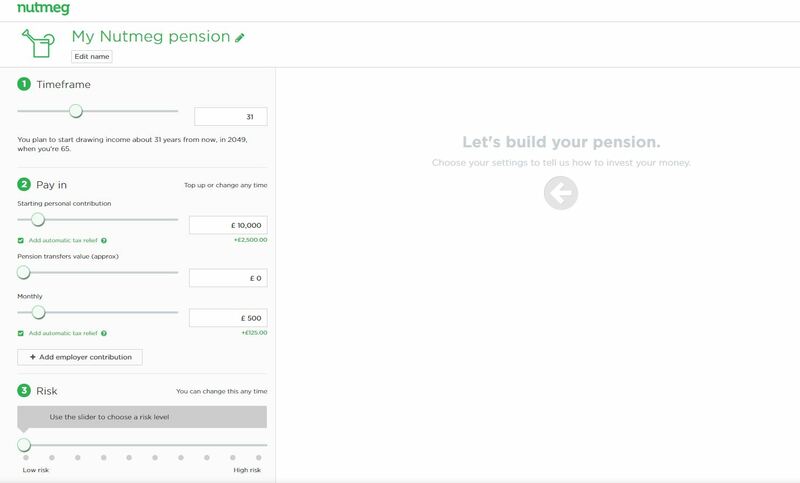 Nutmeg also has an app that lets you alter any contributions on ISA or general accounts with the provider, but you can currently only check your pension performance on it. How does Nutmeg invest my pension pot? Nutmeg has two investment options, managed and fixed allocation portfolios. Pension users can only invest in the managed portfolios, but you can access the fixed allocation portfolios if you open an ISA or general investment account with Nutmeg. 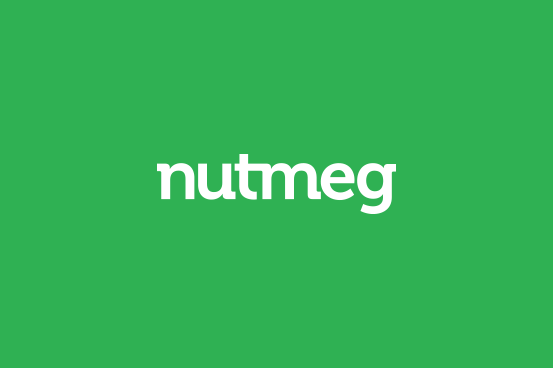 We examine the full range of Nutmeg investment options in detail in our wider Nutmeg review. Nutmeg keeps costs low by using exchange-traded funds (ETFs) which are cheaper than active funds and you get more transparency in terms of where your money is invested. They can track an index, such as the FTSE 100, or hold Government and corporate bonds. The Nutmeg personal pension is invested and managed by Nutmeg, while the administrator is Hornbuckle and the trustee is Embark Trustees Limited, a Hornbuckle company. But all contact you receive will be through Nutmeg. Portfolios are managed and diversified across different assets, regions and sectors and are regularly rebalanced to ensure they are on track to meet your goals. It may be described as robo-advice but there is actually a team of real humans who meet monthly to look at asset allocation and make any changes needed. That is the same as most robo-adivce firms, although there are always exceptions such as Exo Investing. Behind the scenes the asset allocation team is run by Nutmeg’s chief investment officer Shaun Port, alongside renowned British economist John Kay and former deputy editor of the Financial Times, Jane Fuller. Your pension portfolio will invest in assets related to your agreed risk level. This can be changed at any point and Nutmeg regularly offers suitability reports so you can monitor if your attitude has changed and if you are on track to meet your goals. Does Nutmeg’s pension have a minimum investment? The minimum investment for a Nutmeg pension is now only £500, reduced from £5,000 when we last reviewed the product in 2018. We commented at the time that £5,000 was high when compared to their rivals and while Nutmeg argued that the higher minimum helped to diversify the funds across a range of assets, their new strategy seems focussed on acquiring more assets. Can an employer pay into a Nutmeg Pension? Nutmeg will also let employers contribute to the pension, you will need to request details that can then be sent to your HR department. What happens to my Nutmeg pension when I retire? Anyone over age 55 can start taking money out of their pension savings but your portfolio will be set up to maximise returns until up to your chosen pension age that you stated when the account was first set up. This can be changed at any point, making it a shorter or longer term. There are a few choices when you come to retire, you could keep your pot invested, enter income drawdown – allowing you to stay invested in the stock market but make regular agreed withdrawals - or use the money to purchase an annuity. You can also withdraw 25% of your pension pot tax-free. Nutmeg only offers income drawdown, so if you wanted to purchase an annuity you would need to transfer your portfolio to a different provider. There are no extra charges for income drawdown via Nutmeg, beyond the regular pension portfolio and fund fees, but there will be income tax to pay on withdrawals as with any pension. You don’t just have to make monthly contributions, you can also add to your pension by transferring from other providers. A Nutmeg pension transfer is free (although your existing pension provider may charge an exit fee). This can be from an old or current workplace pension, other SIPPs or personal pensions. You should check if you will be losing any valuable benefits before by leaving a provider though, such as guaranteed annuity rates. The only type of pension you can’t transfer is a defined benefit or final salary scheme. The Nutmeg pension charges are based on the costs of its fully managed portfolio and depend on how much you are investing. You will pay 0.75% up to £100,000 and 0.35% beyond that. Nutmeg’s portfolios have a fund fee which averages 0.19%. Fees are calculated on a daily basis. You can log in whenever you want to see where your pension pot is invested and how it’s performing. You will also be sent a valuation four times a year. Past performance is no guarantee of future returns, but Nutmeg does have a long track record that you can view on its website to help you make a judgement. If you want to view analysis of Nutmeg's investment performance against other robo-advice firms then read my full Nutmeg review. In general, it has outperformed a benchmark of competitors, especially with its higher risk portfolios. At present Nutmeg's lowest risk level 1 portfolio has returned 2.8% over the past five years or 0.6% annually. Go up a risk level and returns hit 8% or 1.6% annually. Those on risk level 3 have seen returns of 9.9% over five years and 1.9% annually, while level 4 is at 13.6% over five years and 2.6% per year. The mid-range portfolio 5 – which aims for moderate growth without extreme volatility – has returned 15.6% over five years and 2.9% annually. You then get into the more volatile portfolios, with level 6 returning 17.9% over five years and 3.3% annually and level 7 at 24% and 4.4% respectively. Level 8 has returned 28.4% over five years and 5.1% a year, while level 9 is at 34% over five years and 6.0% annually. The highest risk level 10 portfolio has returned 38.2% over five years and 6.7% annually. There are plenty of other robo-advisers on the market with varying minimum investments and product features. Nutmeg’s main rivals are Wealthsimple, Moneyfarm and PensionBee. Nutmeg has the same minimum investment as Moneyfarm. Wealthsimple has a minimum of just £1 and PensionBee doesn’t actually have a minimum, the caveat being that you can only get one of its portfolios by transferring your existing pension savings. You get the widest choice of portfolios with Nutmeg, at ten, compared with six at Moneyfarm, three with Wealthsimple and four with PensionBee. All four providers will invest using ETFs but their fee structures differ. Wealthsimple charges an annual fee of 0.7%, although this is reduced to 0.5% if you have investments worth over £100,000 or you can get your first £10,000 of your money managed for free for the first year via this offer. PensionBee’s charges depend on the portfolio as well as how much you invest, with fees coming down on amounts above £100,000. For pensions under £100,000 you will pay annual fees of 0.5-0.95%, depending on the portfolio. The costs are halved on values above £100,000. Moneyfarm investors pay 0.7% on the first £20,000, then 0.6% on any amount from £20,000 to £100,000, 0.5% on anything from £100,000 to £500,000 and then 0.4% on funds above that. There is also an average fund fee of 0.3%. All four providers allow transfers from other providers, but PensionBee’s service goes a bit further as it will also help you locate and consolidate any pension savings you may have had in the past. This makes it stand out as a decent pension consolidation service, particularly as you can only get started by making a transfer. Those who want to be more involved also have the option of delving deeper and looking under the bonnet to see the funds and assets their money is invested in and even to project how close they are to reaching their retirement target. Nutmeg regularly provides market updates on its strategy, and coupled with the ability to easily alter contributions and risk, as well as monitoring if and when your portfolio will hit its target. It easy to see why Nutmeg have become the largest robo-adviser in the UK especially as some of the others still don't provide a pension product. If the Nutmeg pension is of interest then I suggest that you read our full Nutmeg review where he analyses Nutmeg's investment performance in detail and also looks at who should consider Nutmeg investments, what their customer are saying about their service and how safe it is to invest with them. What is a SIPP and do you really need one? How does a SIPP work?